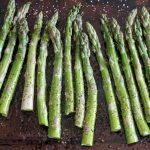 I learned how to make this easy roasted asparagus recipe from a caterer, and it was an instant hit. With only a few ingredients, it's fast to make & delicious. Trim the woody stems off the asparagus. (I prefer to snap them off, but you can use a knife if you prefer. Lay asparagus on a baking sheet, making sure the stalks are not too crowded. Drizzle with extra virgin olive oil and then roll asparagus stalks back and forth in the oil to coat. Sprinkle generously with Montreal Steak Seasoning. Use closer to 1/2 teaspoon if you don't like spicy foods. Roast asparagus in the preheated oven for 3 to 5 minutes. Cooking time will vary depending on the thickness of your asparagus. You should be able to just pierce your stalks with a fork, but they shouldn't be mushy. Squeeze fresh lemon juice over the asparagus when you remove the stalks from the oven. Serve immediately.